Sebastián Piñera Echenique was born in Santiago, Chile, on December 1, 1949. He is the third of six children born to José Piñera Carvallo (1917-1991) and Magdalena Echenique Rozas (1919-2000). He attended Verbo Divino School from 1955 to 1964 and stood out as one of the best students and a member of the Scout movement. He notes that his education was Christian, plural and offered a great deal of freedom, a sense of duty and a strong vocation for public service. Following the election of President Eduardo Frei Montalva (1964), his father was named Ambassador of Chile to Belgium. In 1967, his father became the Chilean Ambassador to the United Nations (UN), and Sebastián returned to Chile to finish his final year at Verbo Divino. In 1973, he married family and youth counselor Cecilia Morel Montes, who earned degrees from Instituto Carlos Casanueva and Universidad Mayor, where she studied Family and Human Relations. Together they are the parents of Magdalena (1975), a history and geography teacher; Cecilia (1978), a pediatrician; Sebastián (1982), a businessman and MBA holder; and Cristóbal (1984), a psychologist. The couple has eight grandchildren and will soon welcome their ninth. 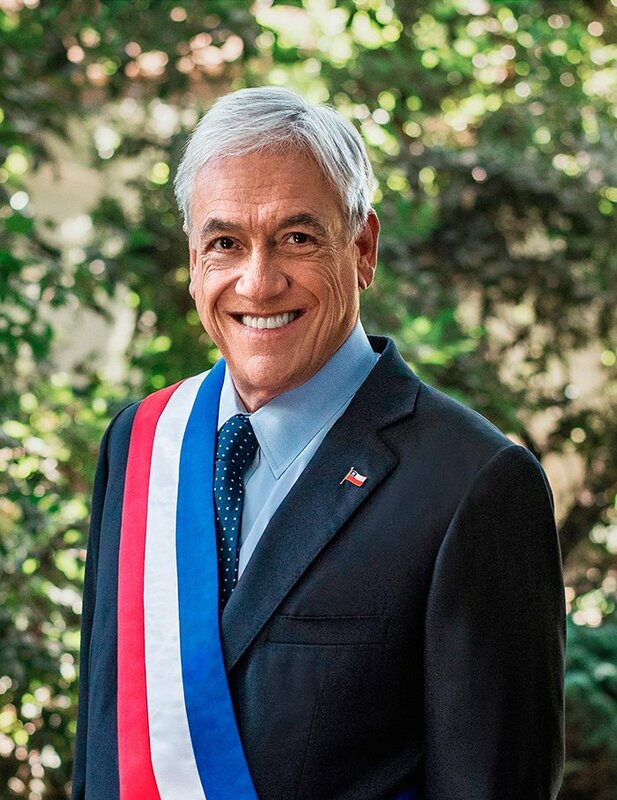 Sebastián Piñera was admitted to the Pontificia Universidad Católica de Chile School of Economics in 1968, earning a business administration degree and the Raúl Iver Prize as the best student in his class. He traveled to the United States in 1973 to earn a master’s degree and doctorate in Economics from Harvard University, where he was able to work with renowned economists, several of whom have won the Nobel Prize. When he returned to Chile in 1976, he focused mainly on teaching, offering classes in the Schools of Economics of Pontificia Universidad Católica de Chile, Universidad de Chile and Universidad Adolfo Ibáñez. He was a consultant for the Inter-American Development Bank (IDB) from 1974 to 1978, at the World Bank from 1975 to 1978, and worked at the Economic Commission for Latin America and the Caribbean (ECLAC), where he actively participated in a macro project entitled “Poverty Map of Latin America and Policies for Overcoming It” (1976). He voted NO in Chile’s plebiscite on October 5, 1988, in order to open the doors to free elections and democracy. He and his wife Cecilia Morel set up the nonprofit Fundación Mujer Emprende in 1989, which promotes the training and development of young women who face economic challenges. Then, in 1993, they created another nonprofit, Fundación Futuro, in order to contribute to and promote education and culture for all Chileans. They inaugurated Tantauco Park on the southern part of Chiloé Island in 2005 to conserve and protect ecosystems and endangered species, promoting sustainable ecotourism programs. In 1989 Sebastián Piñera was an independent candidate for Senator for the Democracy and Progress Pact for the Eighth District of the Eastern Metropolitan Region and was elected during the 1990-1998 legislative period. He later joined the Renovación Nacional Party. As a senator, he served on the Treasury, Health and Environment, Economics, Human Rights and National Assets commissions. His concern for the environment is reflected in the submission of the bill for the Law on the Protection of the Environment and Nature. He also contributed to drafting the bill to regulate legal and ethical principles of human and assisted reproduction techniques. During his time in the legislature, he was elected Best Senator by his peers together with then-Senator Andrés Zaldívar. Piñera also served as the President of the Renovación Nacional Party between 2001 and 2004. At the May 2005 National Council meeting of the Renovación Nacional Party, Sebastián Piñera was proclaimed presidential candidate for the January 2006 elections. He was defeated by Michelle Bachelet, who won 53.5% of the votes (Piñera received 46.5%). The main focus of his activities then became traveling Chile to listen to the needs and demands of the people, supporting Alianza por Chile candidates in the 2008 Municipal Elections and creating the Tantauco Groups, which were composed of over 1,200 professionals who formed 37 working commissions to study and propose public policies for the future administration. The Coalición por el Cambio (Coalition for Change) was founded in May 2009. This new alliance included the Renovación Nacional and Unión Demócrata Independiente parties, which had already been part of the coalition, as well as new groups such as Chile Primero, Humanismo Cristiano, Norte Grande and independents. This new coalition named Sebastián Piñera as its official candidate for President. His administration (2010-2014) allowed Chile to steadily move towards the construction of a society in which all Chileans have opportunities to develop with the safety needed to take the risks inherent to life in society, entrepreneurship, innovation and effort and in which values such as respect for life, freedom, personal responsibility, family, diversity and care for the environment are protected. The country recovered its capacity for growth (average of 5.3%) and job creation (over 1 million new jobs), and measures were taken to promote women’s ability to work through a six-month maternity leave period and subsidy for female workers, which allowed 576,000 more jobs to be created during his first administration. In the area of healthcare, 27 hospitals were inaugurated, the number of illnesses covered by the AUGE healthcare program were increased from 56 to 80, the 7% healthcare contribution pensioners previously had to make was eliminated, the “Elige Vivir Sano” (Choose to Live Healthily) program was developed and the Pharmaceuticals Law, which benefits all Chileans on a daily basis, was passed. In the field of education, his administration took decisive steps towards building a society of opportunities, increasing the student subsidy, creating the Teaching Vocation Scholarship, inaugurating 60 schools of excellence, decreasing the state-sponsored loan interest rate to 2% and tripling the number of scholarships available for higher education. As part of his work on poverty, he created the Ministry of Social Development and developed the Ethical Family Income, benefitting over 218,000 families and cutting poverty rates in half. Finally, he created the Ministry of the Interior and Public Safety and increased the number of uniformed police officers by over 8,000. These measures reduced the victimization rate from 33.6% to 24.8%, which means that 1.4 million fewer Chileans were victims of crime. After finishing his Presidency, Piñera decided to continue to work on tasks that he had not been able to address during his administration. He returned to the presidency of Fundación Futuro and received the National Environmental Award from Recyclápolis in 2015, which was organized by the newspaper El Mercurio and Pontificia Universidad Católica de Chile. He was the Director of Fundación Avanza Chile between 2014 and 2017, where he worked to develop open discussion of important ideas and good public policies. His goal was to expand freedoms and opportunities for all Chileans in order to move towards a more democratic, just, prosperous, pluralist and fraternal society. On March 21, 2017 at a major event held at the Museum of Natural History in Parque Quinta Normal, Sebastián Piñera announced his candidacy for President. He was subsequently elected the sole candidate of the Chile Vamos bloc in the primary held on July 2 of that year. Following the November 19 general election and the presidential run-off election held on December 17, 2017, Sebastián Piñera was elected President of Chile, winning 54.51% of the vote and defeating opponent Alejandro Guillier. President Piñera was inaugurated on March 11, 2018.